Biogas is a gas produced by the breakdown or decomposition of organic waste in the absence of oxygen and comprises a mixture of gases, mainly carbon dioxide and methane; this can be used as an alternative energy source instead of firewood and fossil fuels, according to the Guyana Energy Agency (GEA). Public Communications Officer, Taiwo Williams, disclosed that the agency has been monitoring and supporting the installation of bio-digesters. At present there are approximately thirty (30) bio-digesters installed in Guyana that use organic materials to produce biogas. GEA encourages livestock farmers (cattle, pig, etc) to take advantage of this technology and cash in on potential savings. The production of methane gas will help to conserve on imported energy sources (fossil fuels) thereby allowing for savings on energy bills and a positive contribution to the environment. “There are many raw materials (organic materials) from which biogas can be extracted, for example, animal manure, leaves, twigs, grasses and garbage, among others. Biogas production from animal waste provides a unique opportunity to mitigate the effects of waste produced on farms while providing a cheap and sustainable source of energy,” the GEA underscored. “To facilitate the production of biogas a structure referred to as a bio-digester unit (BDU) is used. A bio- digester aids in the decomposition of organic materials, such as those listed above, to produce methane gas (biogas) that can be used for cooking, heating, lighting (using gas lamps), electricity generation, operation of farm machinery and other energy needs. The decomposition of waste material during anaerobic digestion is caused by bacterial action rather than high temperatures. It takes place in almost any biological environment, but is favoured by warm, wet and low oxygen conditions. Anaerobic digestion also occurs in two major situations created by human activities: Sewage (human waste) or animal manure. 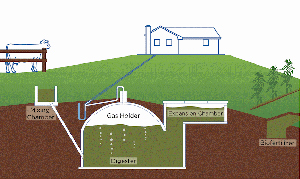 Landfill gas produced by domestic refuse buried at landfill sites. In nature, there are also many raw materials (organic materials) from which biogas can be extracted: human and animal manure, leaves, twigs, grasses, garbage, agricultural and industrial wastes with organic content greater than 2%. The biogas produced can be used for cooking, heating, lighting (using gas lamps), electricity generation, operation of farm machinery and other energy needs. The effluent produced from the process can be used as a fertilizer for crops. The cost to set up a bio-digester including parts and labour should be approximately $120,000 and would replace the need for at least one 20-lb LPG gas cylinder per month. The simple payback for the installation based on an average cost $3,600 per 20-lb LPG gas, is just under three years. After year three except for basic maintenance and labour, all gas produced will be free. Biogas is primarily used as a fuel for cooking purposes and electricity generation. Scientific advances have significantly enhanced biogas yield production, leading to the development of commercial or large/medium scale biogas plants in recent years. In terms of both consumption and production of biogas, Europe leads the other nations mainly due to increased government regulation for renewable energy initiatives. The German experience is particularly impressive. Since the introduction of feed-in-tariffs for biogas in Germany, over 7000 biogas plants have been developed, and are on target to develop 17% of power from biogas. However, although Europe dominates biogas production, the technology application is fast increasing in Japan, Australia, New Zealand and the United States. The Asia-Pacific biogas plants market is displaying strong appetite for growth, especially in the emerging markets such as China and India. Global Analysts, Inc reports that the global biogas plants markets will reach $8.98 billion by the year 2017. The desire to reduce dependency on fossil fuels, heightened attention to eco-friendliness, and government incentive programs will continue to grow investment in biogas facilities.